It's time for more Comic-Con pictures! Thursday is the day that I said to myself, "I need to start taking more pictures". It turned out to be a pretty busy day. Let's get to it. The Walking Dead always has a big display in the television area of the convention floor. It's always too crowded for me to do anything but walk by. But they sure do a nice job at adding zombies to the area, and keeping them from getting mobbed. That's the Walking Dead, folks, in case you needed to know. They might as well keep setting up at this point. This year seemed extraordinarily busy in the convention hall. Wednesday and Thursday seemed especially crowded compared to years prior. I saw a number of brain slugs this year. This is an unlikely pairing, but I like it. The Sideshow booth is always filled with gawkers, such as myself, staring at the ultra-expensive, ultra-awesome statues on display. This Spider-Man 2099 statue is just incredible. After the show, I learned that there was a Beast Wars Megatron statue somewhere nearby. I wish I could have seen that, because I'll almost certainly never be able to afford it. I spent some time at the New England Comics booth signing issues of the new exclusive comic with artist Ian Nichols, who drew sketches all throughout the show. When someone didn't have a preference on what was drawn, he drew Caped Cod, which we both got a kick out of. There were some big changes at the Rotten Tomatoes panel this year. They moved to an offsite location, they had a whopping three shows, the shows took place during Comic-Con instead of at night, and they had a new co-host for the convention - Comedy Bang! Bang! 's Scott Aukerman! I got temporarily lost on my way to this particular show, but thankfully I made it in time to see the whole thing. Grae Drake was there once again and her costume, as always, did not disappoint. I got up and lambasted Jurassic World this time around (it deserved it), and snapped this picture while the critics were discussing my (very correct) claims. Grae is such a wonderful person - it's always great to see her at these panels. Incredibly enough, I got on "the list" and was able to get into the VIP section, where free swag abounded. I grabbed a lot. After the panel, because I wasn't too far away, I made my way to Skeletor's Lair. I didn't get to go there last year, so I was happy to see it again. There were no Skeletokens this time around, which was disappointing, but everyone working for Super7 seemed thrilled. That Skeletor piñata looks pretty cool. And they always have room for a toy display, too. If you weren't convinced that The Tick was just everywhere at Comic-Con, let me present to you: the Tick bathroom. This was located in the interactive zone across from Petco Park. Far be it from me to be too good to take pictures in a bathroom. The pilot was streaming alongside one wall, blue lights gave the area an azure ambiance, and a little toy fell into a basket when you flushed the toilet. It was the full experience. I don't want to stay inside all the time at Comic-Con, but the outside events are often almost hopelessly crowded. The interactive zone is almost shoulder to shoulder, and you're standing on a concrete parking lot in 80-degree, sunny heat. You have to be a real diehard (or someone without a pass) to brave those conditions in most cases. I complain about Fox's mishandling of the Fantastic Four (and rightfully so), but I wonder what it's like to be an X-Men fan, hoping to see those characters meet up with the rest of the MCU. At least some of those movies and tv shows are good. How the convention center stays climate controlled during the show is beyond me. They must have the air conditioning cranked up all the way, 24 hours a day to keep things relatively cool. Gone are the days when people would wait until Saturday to show off their best costume work. There were some great ones on display on Thursday. Red Sonja was apparently filming a tv spot. I thought that this Teen Wolf costume was great, especially the mask. I wonder if this is the Michael J. Fox or Jason Bateman version. I guess I spent a lot of time outside on Thursday. Near the end of the day, I made the trek to the Tick offsite location. Luckily for me, the line, which was hours long at the beginning of the day, had shrunk enough that I only had to wait about half an hour to get in. It gave me enough time to try and take everything in. Look at all of that blue. As a way to steal your personal information, Amazon had information and trivia stations set up throughout the line. The trivia consisted of nine questions, and they weren't all about the show. There was at least one about New England Comics, which was a nice surprise. I got all nine questions right (thankfully), which apparently made the computer malfunction or something, given my final score. Here's the Tick antennae from the back. They really moved! And these controls were actually functional. With a nice aesthetic, too! Lying Cat walked by as I got to the front of the line. On this day, I went through the Tick scavenger hunt, which took place in a number of set recreations. It was all very detailed. On the screen, you can see Griffin Newman, who filmed some content just for this exhibit. There were a number of props throughout the event with show-specific references. I didn't steal any of them, but it was tempting. At the end, everyone got a picture in front of a green screen. 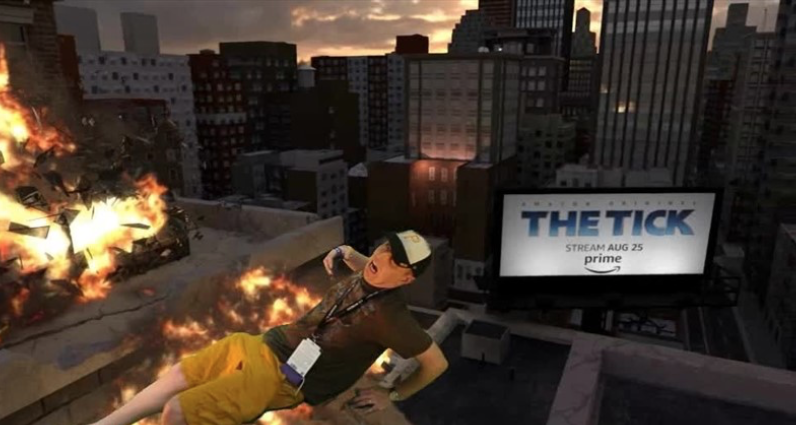 Here I am being blown up, I guess, next to an ad reminding you to watch The Tick on August 25th (only on Amazon Prime)! After the convention ended, I went to the Music Box, a mile or so from the convention center, to see Comedy Bang! Bang! Live! Scott Aukerman was there again. And he brought some friends. The night still wasn't over, though. NerdHQ did not have a big presence at this year's show, unfortunately, but they did team up with SyFy to sponsor two big dance parties. I missed the NerdHQ panels, which are a highlight of the show, but I'm happy that this was still around. Hopefully it's a one time thing, and 2018 will see NerdHQ back at full power. ...and some classic arcade games on the bottom floor. It was very cool to see all of the old arcade cabinets lined up next to each other. I think I see Missile Command to the right of center. Thursday was a really huge day! I'm not sure that I even realized it at the time. And the show was just getting started. More to come! 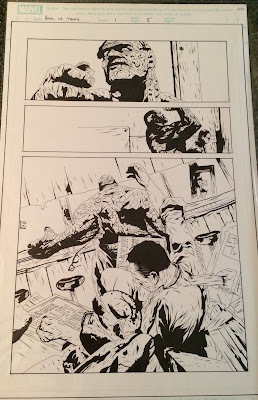 Hulk vs. Thing original artwork by Jae Lee - one of my favorite pieces of all time! 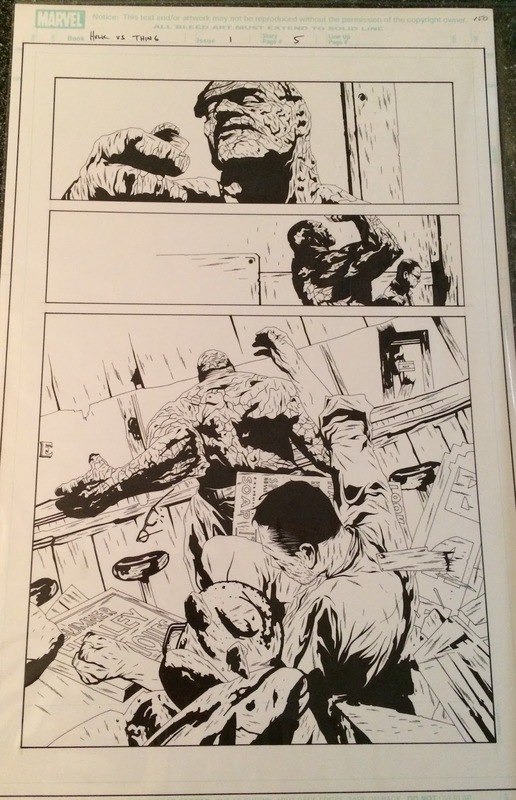 I got a heck of a surprise for my birthday this year - a page of original art from the Hulk vs. Thing miniseries by artist Jae Lee. And not just any page, but one of my favorites of all time. "Hulk and Thing: Hard Knocks" was a miniseries from 2004, written by then-Incredible Hulk writer Bruce Jones. As such, it picked up a few of the plot points that were running through the regular Hulk book at the time. I was thrilled that the Thing was getting a series, but also a little worried that, since it was pretty much just the Hulk comic with another name, the Thing would get knocked around a lot in the book in deference to the title character. The opposite actually happened, though, as the Thing spent a good bit of the book beating up the Hulk (and Bruce Banner), and it was even revealed that the Thing was the winner of the original matchup back in Fantastic Four #12. In the series, the story keeps coming back to Ben Grimm and Bruce Banner in some out-of-the-way restaurant/bar. The Thing is in a bad mood and wants to commiserate with the Hulk, one of the only others out there who can understand what it's like to be a monster. The problem is, the Hulk shows up as Bruce Banner, and he's happy to stay that way. To force him to change into his green alter ego, the Thing slaps his around a few times...which is just really...well...I enjoyed seeing it a lot. And now I own a page from the first time it happens. 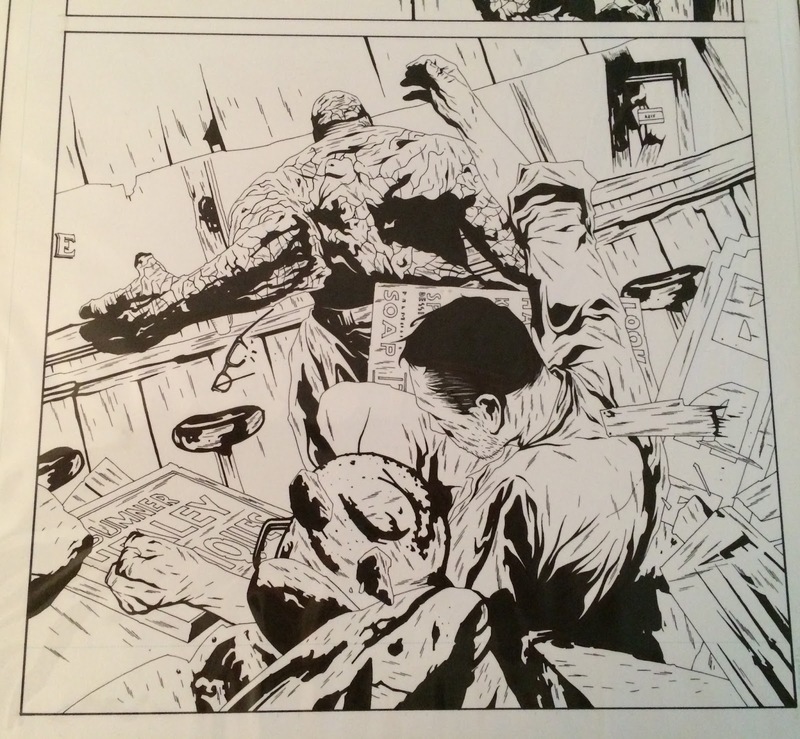 This particular page is from the first issue of the series. Jae Lee both pencils and inks this beauty. Lee draws a different Thing than most - his version keeps some of Grimm's human features, and his hide looks more scaly than the segmented rocks that most artists draw. But it's a good variation and one that stays true to the character's obsession with his disfigurement. I never thought I'd own a page from this book, let alone THE page that makes this series so enjoyable, I guess in my own twisted fashion. This is a real beauty. Wednesday night of Comic-Con is only open to those who have four-day passes to the show, and it's titled "preview night", but it's really just a mad dash and a frenzied rush as attendees get a head start on the convention. I have to think that in years to come, hours will expand for this day and it'll become something closer to a full day in most other regards, too. This year, the show floor opened at 5:30, a half hour before the advertised time, so maybe we're slowly getting there. I talked to him for a minute and learned that he was a writer for the Bleeding Cool website. His Tick paraphernalia came from the offsite location, which was open to press only on Wednesday. I was, of course, stunned to see all of the gear - he gave me a pair of antennae, which was a nice gesture. The voice of Comic-Con spoke out at the end of our conversation, announcing that the hall was open, but the security guards at the doors didn't seem to hear it and held up this line from entering for a solid minute, which I'm sure drove everyone waiting absolutely crazy. The first booth I visited was the Pixel Party booth, where I bought their new Tick pixelated action figure, which I think is really great. I got a chance to talk to a few of the people at the company - all great guys who are excited about The Tick. Next I hit up the ComiXology booth to get the third set of comic book creator trading cards (which is as absurd as it sounds). I would go to great lengths to get my face on one of their cards, just saying. Almost as soon as the doors opened, the place was swamped with backpacked individuals. I saw Andrew Aydin, artist on the "March" series, at the IDW booth! Lockjaw made an appearance promoting the new Inhumans show. Near the end of the night, I saw Luke McGarry and got my first Thing sketch of Comic-Con 2017 (in the new Thing sketchbook)! McGarry is probably best known for "Sad Chewie", but I knew him because he drew Weird Al in a Festival Supreme 2016 poster - which I was also able to buy at the booth. I got some great Thing sketches this time around. Preview night ended up being 3.5 hours this year, which never feels like enough, but I managed to get a good amount done in that time. After walking through the Gaslamp District and getting some pizza, I called it a night. That's it for Wednesday. I'll post pictures for Thursday soon! It's time once again for Comic-Con pictures! It's an annual event that sometimes stretches into December or whenever. But it has arrived! Let's see what we've got. These pictures were taken on the Tuesday before the show, the day I arrived. I arrived early enough to grab my badge from the convention center and check out some of the events still in construction. Many (most) of the pictures you'll see on this post and others deal with The Tick. This is naturally because I have something of a vested interest in the property, but also because Amazon made sure that the branding was just about everywhere within a quarter mile of the convention center. I knew that there would be a lot of hype for the new show, but I couldn't fathom just how much there would be. Right outside of the convention center was The Tick Activation Site. What does "activation site" mean? What were they activating? In any case, there was Tick blue by the gallon, as two huge stages were in the process of being built as I walked by. Amazon revealed character posters for the show earlier in the week, and we all got to see them at full size at the show. Of course. the most impressive aspect of this offsite event was the 20-or-so-foot tall Tick antennae display. Yes, I reached up and touched it when no one was looking. I took pictures of the site until someone came out and told me to stop. I guess Comic-Con doesn't want pictures to leak before the show opens, but it's got to be tough when there are so many (really cool) displays popping up out in the open. After a good 20 minutes of gawking, I made my way inside the convention center to drop some things off at the booth. I picked up the 2017 bag and program along the way. It's always fun to see the convention hall on Tuesday, because there's so much frantic building going on. Everyone is working as hard as he or she can on this day. It's neat to see things come to life. There are also many people-sized crates all over the floor. I'm not saying that people are being shipped in in boxes, but I'm not NOT saying that, either. After seeing so many Tick sights outside, I was still floored to see this circular banner on display inside the lobby. How incredible. I'm sure I took more than a few of these pictures during the show. It's tradition, I guess. The banners hanging on street lamps were once again Marvel themed. This time I saw Black Panther and Thor banners. More to come...of the actual show.